In a joint effort between representatives of international organizations to respond to violence against women, the panel "Regional and International Mechanisms for the Comprehensive Approach to Violence against Women and Girls" was organized by the CIM as Technical Secretariat of the Follow-up Mechanism to the Belém do Pará Convention (MESECVI). 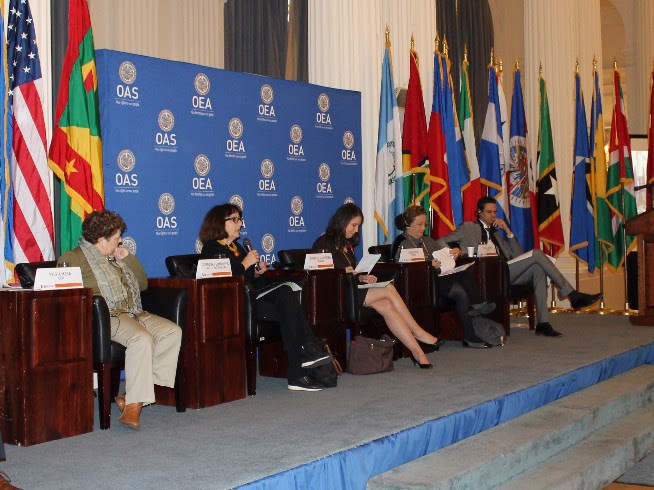 The event was held at the OAS headquarters in Washington, DC, as part of the commemoration of the International Day for the Elimination of Violence against Women (November 25th). The event brought together Sylvia Mesa, Vice President of the Committee of Experts of the MESECVI (OAS); Dubravka Šimonović, Special Rapporteur on violence against women, its causes and consequences of the UN; Feride Acar, President of the Group of Experts of the Convention on the Prevention and Combat of Violence against Women and Domestic Violence (GREVIO) of the Council of Europe, and Paulo Abrão, Executive Secretary of the Inter-American Commission on Human Rights (IACHR / OAS). Opening the event, the OAS Secretary General, Luis Almagro, highlighted the importance of strengthening women's rights at the regional level. "Violence against women and girls has made us one of the regions with the least chance of progress and with democracies that are weakened by the inefficiency of justice and the advance of impunity," Almagro acknowledged. This panel highlighted the joint work of the participating organizations to comprehensively address violence against women. "I hope this is the beginning of something that will give good results, but we need the support of regional and international organizations," said Šimonović. Likewise, Sylvia Mesa stressed that "this event is important because it allows us to share our experience in following up on our international instruments," referring in her case to the Belém do Pará Convention. At the global level, there are different Conventions and Mechanisms aimed at eliminating violence against women. In the Americas, there is the Belém do Pará Convention, which establishes the duty of the States to harmonize their internal legislation to guarantee the rights established in the Convention and to eliminate norms, practices and customs that deepen violence and discrimination against women. In addition, the OAS also has the Inter-American Commission on Human Rights, which includes the Rapporteurship on the Rights of Women. On the other hand, the Council of Europe works with the Istanbul Convention, which deals with the same ends in that region. At the international level, these regions are part of the United Nations, which addresses the issue from the CEDAW and the Special Rapporteurship on violence against women, its causes and consequences. These Mechanisms participated in the event from a global approach to unify efforts and to commit towards more equal democracies. "Implementation is a challenge that we have ahead of us and we should respond adequately," explained Šimonović. Finally, the event was closed by Carmen Moreno, Executive Secretary of the Inter-American Commission of Women (OAS), who mentioned that regional campaigns against women's rights are being promoted with increasing force and funding, for which she saw these dialogues "... as the beginning of a stage of collaboration, to work together against all forms of violence against women."